The first quarter of 2017 once again posted strong numbers for the Atlanta real estate market. We continued to see a healthy (albeit somewhat more modest) increase in prices per square foot and very strong average sales-to-list-price ratios. Here are a few highlights from our Q1 market analysis. • Compared to Q4, prices per square foot rose approximately .3% in the 15 communities I track. • The average sales-to-list-price ratio during this period remained roughly the same at 98.1%. • The median days-on-market for these same communities remained almost exactly the same at 21.9 vs. 22 days (anything less than 30 days indicates a very strong seller’s market). All 3 of these metrics continue to indicate a strong market for sellers. With a 98% sales-to-list-price ratio, sellers didn’t have to discount much at all in order to sell their homes. In fact, hot areas like Candler Park and Grant Park were once again closing in on 100% which indicates intense competition in these neighborhoods. 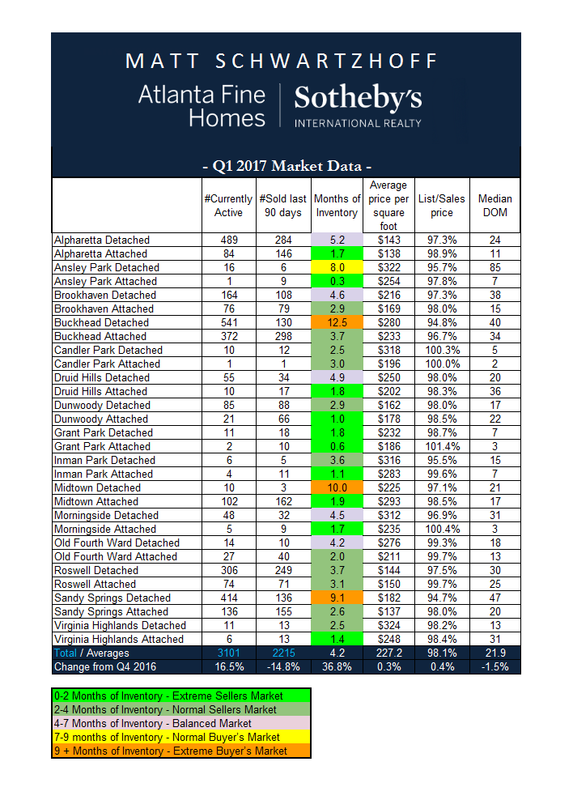 While all of the metrics continue to suggest that 2017 is shaping up to be another strong year for the Atlanta real estate market, the somewhat slower price appreciation we saw this quarter is in keeping with my 2017 predictions. I still believe Metro Atlanta will experience several more years of moderate price appreciation, primary because there will be continued pressure on the supply side until builders finally begin to ramp up in earnest. Interestingly, a CNBC report last month showed that builders are still only producing homes at roughly 75% of the historical average. The Atlanta Journal and Constitution also just announced that over 1,700 people moved to Atlanta every week in 2016. With that in mind, it could be some time before we see a more balanced market. Note: “Average months of inventory” is how long it would take the market to absorb all currently listed homes given the sales pace that occurred during the preceding 90 days. This metric is often used as a general indicator of whether we’re in a Seller’s or Buyer’s market. For reference, most economists believe that a balanced market (one that doesn’t favor the buyer or seller) occurs when there’s between 4 and 7 months of available inventory. You can view additional information on each of the 15 markets I monitor below. If you have questions about the value of your home or trends in your neighborhood, feel free to call, text, or email any time – I’d be happy to help!